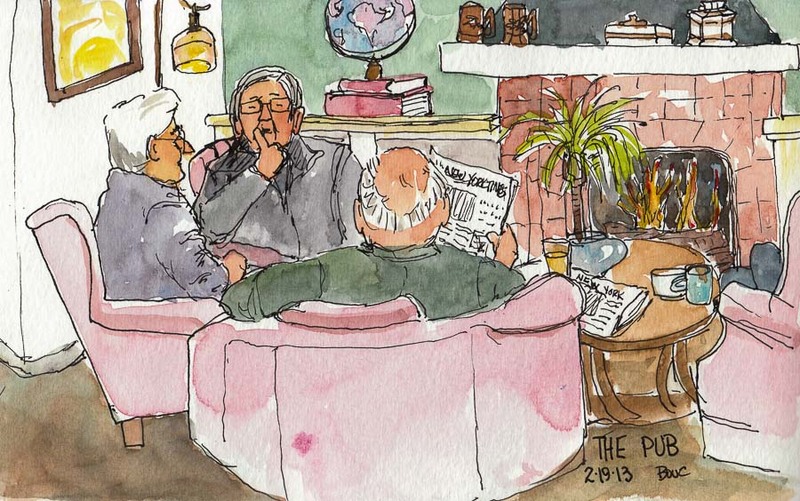 The Pub on Solano near the border of Albany and Berkeley is a hidden-away, cozy place to sketch, play chess, or chat with friends or friendly strangers while sipping espresso, beer or wine and hang out as long as you want. The Pub’s clientele tend to be colorful people who are interesting to eavesdrop on while sketching. The old guys I sketched above weren’t exactly firecrackers but the 40-something, rough-hewn guy in rainbow tie-dye and long blond hair sitting behind me kept me entertained with daring travel adventure stories of remote and distant lands told to his friend who was soon departing. A bit of an anachronism, The Pub also sells tobacco and cigarettes from around the world and has an interesting display of old pipes. The indoor areas are smoke-free but they offer a front and back outdoor patio where smokers can enjoy their vice(s). Wow! I love this little painting. I really like ink and watercolour work. This is so full of the character of the place, I love this painting. Thanks Nancy! A appreciate your taking the time to leave a comment. I love the bald guy with his back to us. I can smell the fire and the stale tobacco smoke! Great painting. Thanks for your comment on my blog. It might be time to make a visit East!